Organikids Childcare Centre’s Beth Rice with Emily Dewsnap, Luke Anderson and Charlotte Street. 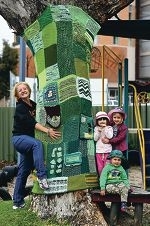 The activity, which involves colourful displays of knitted or crocheted yarn to cover objects has become common-place in the Town with a group of locals yarn bombing trees on Old Perth Road. Led by residents Lani Retter, Deb McMahon and Nataasha Lethbridge the tree also features crocheted interactive learning pockets put together by parents and grandparents of the children. Director Beth Rice said the tree had become the star of the playground. ‘It’s such a great initiative by the ladies to come up with something like this, to be involved is fantastic,’ Mrs Rice said. Yarn bombing is a new activity that has recently taken place in major cities around the world.